Day 43 -- We've Been Shot! Day 43 — We’ve Been Shot! MUNI’s six-week birthday celebration was punctuated by a visit from our vet! Besides being examined head to toe and being weighed (3 pounds, 4.2 ounces), MUNI discovered by dogs don’t always have a good time when they see the vet. MUNI received her first in a series (of 6???) puppy shots. Today was the just the basic anti-the-most-common-and-nasty illness shots: parvo for sure! She complained some, but, well, she is a puppy. We were warned by the doctor that MUNI would likely run a fever and could be lethargic. Lethargic didn’t happen! I don’t know about the fever, but MUNI kept to her new schedule of hard play followed by hard crashing. We think it was an okay day for MUNI, despite the vaccinations! 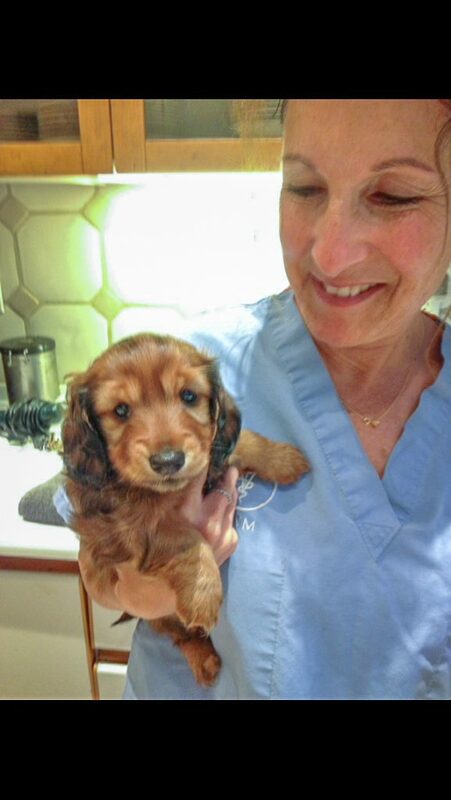 This entry was posted in dachshunds and tagged dachshunds, Day 43, Jill Chase, puppies2018, vet, zenith puppies. Bookmark the permalink.